ONLY Ngezi Platinum Stars and Highlanders remain the two unbeaten teams in the Castle Lager Premier Soccer League after seven rounds of ecstasy for them and torment for others. FC Platinum suffered their first loss of the season courtesy of new boys Bulawayo Chiefs, who outclassed the champions 2-0 at Luveve Stadium on Saturday. The score line only remained respectable due to Chiefs' failure to convert almost half a dozen clear scoring chances they created. Log leaders Ngezi and Bosso maintained their unbeaten run with victories over Mutare City Rovers and Shabanie Mine respectively. Ngezi beat Mutare City 2-1 at home to take their points tally to 19, while Bosso leapfrogged FC Platinum into second place with 17 points following a classy comeback to see off Shabanie 3-1 at Barbourfields Stadium on Sunday. Their unbeaten run and weekend wins have set up a mouth watering top of the table clash between the two sides at Baobab Stadium in Ngezi this Saturday. The two sides have remarkably improved compared to last season and are playing some good football that has delighted even opponents' fans. By this time last year, Ngezi had 13 points from four wins, a draw and two defeats. Right now the platinum boys have won six times and drawn once. At this stage last year, Ngezi had scored nine goals and conceded four times, but they have been solid at the back, conceding just two goals, while their frontline has hit the net 10 times. It is such statistics that give Ngezi hope that their ambition of winning the title is on track. Highlanders have also improved under their legendary son Madinda Ndlovu, picking up 17 points compared to 13 at this stage in 2017. Bosso's Match Day Seven match in 2017 was given to Dynamos on a 3-0 score line following abandonment of the encounter following some violent disturbances at Barbourfields Stadium when the two sides were evenly balanced at 1-1. Highlanders have gone on to score 11 goals, three more than they did last year under Dutchman Erol Akbay. They had conceded four goals; the same number they have let in so far. But there's something different about the Highlanders of 2017 and this season. There's a certain something about the way the youngsters are playing that seems to suggest that Bosso fans could be reliving the glory days. 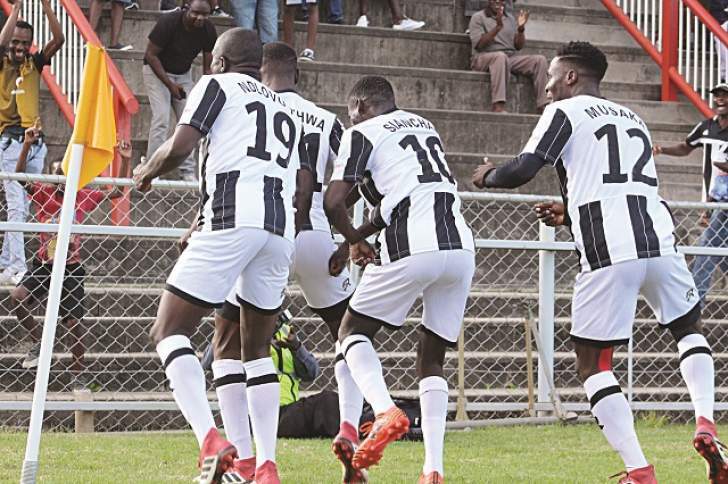 Although it's still early to declare with certainty that the glory days are back, the spirit of oneness flowing through the Bosso camp suggests that something good is happening. Fans have suddenly returned to Barbourfields in their thousands to watch Bosso's youngsters known as ECD. Not only are the youngsters playing some enterprising football, but they have also developed a sense of self-belief that has seen them winning or drawing while playing good, entertaining football for 90 minutes. The Ndlovu-led project of returning Bosso to its old ways of promoting players from the junior ranks instead of buying already established stars has a huge buy-in from the fans, who have cheered and encouraged the lads throughout their home matches this season. The flair, energy and skill displayed by the youngsters seems to have hypnotised the Bosso faithful and also rekindled the fire of those that had elected to stay away due to the heartache and pain previous sides subjected them to. On Sunday, Bosso found themselves trailing in a game for the first time this season after Shabanie went ahead through a sublime goal by Donald Makuwe in the 12th minute. Makuwe volleyed the ball past the badly positioned home side's goalkeeper Ariel Sibanda from outside the box. The technique and execution was so brilliant to behold that even the thousands of Bosso fans applauded. It was a goal fans were used to witnessing on their television screens in the elite leagues of Europe. Despite the despair of going behind to a delicious goal, Ndlovu's boys evoked emotions of yesteryear with their never-say-die spirit and the sea of black and white clad fans played their role by roaring the team on. The fans created such an intimidating atmosphere with their vuvuzelas, whistling and songs reminding the players who Highlanders are. And Bosso players responded, with central defender Peter Muduhwa levelling the scores with a cheeky 40th minute back heel to send the fans wild. Newman Sianchali, who is on loan from Southern Region First Division One side Talen Vision, scored his first goal for Bosso in the 55th minute to give them a deserved lead before Brian Banda squeezed a shot under Shabanie goalkeeper Petros Moyo's armpits to dash any hopes the visitors had of forcing a share of the spoils. While Highlanders and Ngezi celebrate their victories, the defeat of FC Platinum has put caretaker coach Lizwe Sweswe under the spotlight. Being overrun by Chiefs, who created more scoring opportunities than FC Platinum, will certainly get the champions' players tongue lashed. FC Platinum assembled what was expected to be a mean machine, but they were outclassed and outplayed in every department by Chiefs, who showed no respect for the champions. While Highlanders' archrivals Dynamos are singing the blues following a winless run in seven outings, Bosso fans have started singing victory songs, but can they maintain the rhythm, tune and melody up to the end of the season? This Saturday's outing at Ngezi will help answer that question.